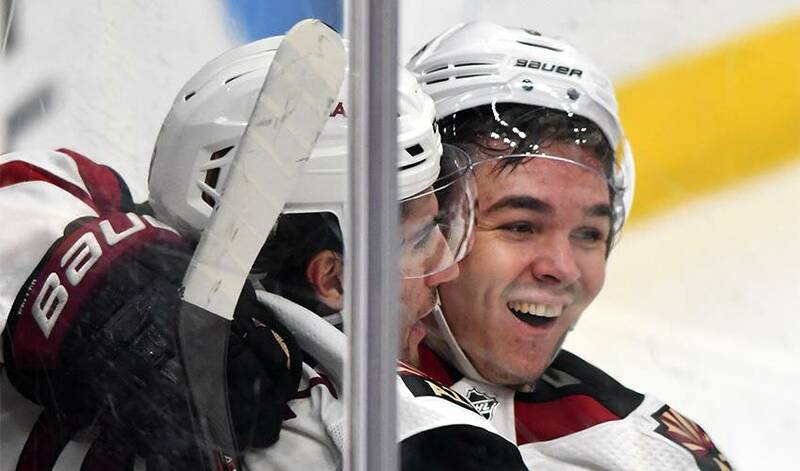 If there was any doubt Arizona Coyotes crafty sophomore Clayton Keller was worthy of being selected for the 2019 NHL All-Star Game this weekend please check out his timely goal in Toronto against the Maple Leafs last Sunday. The game was deadlocked in a 1-1 tie when the pint-sized forward deftly lifted the stick of Maple Leafs defenceman Morgan Rielly to lasso a chip out along the sideboards from his linemate Christian Fischer. Rather than make a risky pass back to Fischer while on the rush, Keller decided to take a shot. He beat Toronto goalie Frederik Andersen with a bullet shortside for a go-ahead goal in the second period. Arizona went on to surprise the Maple Leafs with a 4-2 victory. The Coyotes have won six of eight games entering the break. Keller has played a big part in his team’s recent run with three goals and five points during this stretch. “I think I’ve been playing my best hockey of the year right now,” said Keller, who in his 132nd career game earlier this month checked in with his 100th career point to become the fastest to reach that milestone since the Coyotes moved to Arizona in 1996. Keller can pinpoint three memories growing up in suburban St. Louis that determined his future to become a pro hockey player. The first was a birthday skating party for a friend in his neighbourhood. He immediately fell in love with lacing up his skates and touring around the rink. The second was his mother Kelley taking him to watch a high school game at the arena around the corner from their home. The family also had a pair of season tickets for the Blues. When Keller would accompany either his dad Bryan or grandpa, rather than sit in his seat, he would sit in their lap in order to get a better view of the action. All these years later, Keller finds himself at the NHL All-Star Game in San Jose with Crosby, Kane and others. The 20-year-old Keller will be the third youngest in the game, next to Vancouver Canucks rookie Elias Pettersson, who is four months younger, and 19-year-old Dallas Stars defencemen Miro Heiskanen. Before he left St. Louis at 16 to join the United States development program in Michigan, Keller was coached in minor hockey by a couple of former Blues in Keith Tkachuk and Jeff Brown. The Coyotes selected Keller seventh overall at the 2016 draft. He was one of five St. Louis area players chosen in the first round in that draft, joining Matthew Tkachuk (sixth, Calgary Flames), Logan Brown (11th, Ottawa Senators), Luke Kunin (15th, Minnesota Wild) and Trent Frederic (29th, Boston Bruins). Yes, Tkachuk and Brown are the sons of the aforementioned former Blues. “I was lucky to have [the former Blues] as coaches,” said the 5-foot-10, 170-pound Keller, who was nominated for the Calder Trophy last year, along with Brock Boeser of the Vancouver Canucks and eventual winner Mathew Barzal of the New York Islanders. Keller was having dinner on New Year’s Day when his mobile phone rang. On the line was longtime Coyotes executive vice-president of communications and broadcasting Rich Nairn. He informed Keller that he would be going to San Jose for the all-game. “There’s not one guy I’m looking forward to meeting,” he said. “These are the best in the world and I’m looking forward to seeing them all.